Initially I wasn't on board for digital comics but when I had an iPad (9.7) I began experimenting with digital and it turned out to be convenient. The space-saving option is what sold me and the ability to check out older comics that are no longer in print or will not be re-printed. I've sold my iPad since but have been in the market for one. The Pro is probably overkill (pricewise too) for me for a comics reader. I've been eyeing the entry-level iPad (128GB) for a while now. However, I am still going to stick with trades for series I follow and enjoy. I have a good collection and have been reading since 2007. I don't plan to sell what I've accumulated. I don't know if anyone posted about this already or not, I just found out about it the other day. 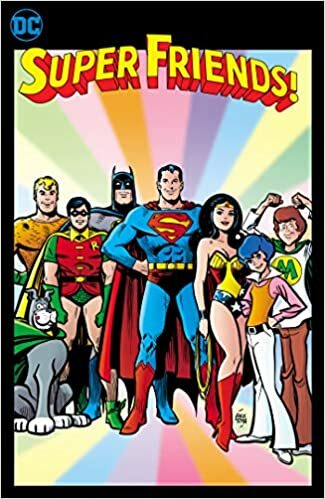 According to Amazon, DC Comics is going to release a hard cover collection (similar to the Showcase Presents) of the first 26 issues of Super Friends. They are listing the date as 12/31/19. I don't know if it will be in color or black and white (like the Showcase Presents was). With so much content heading to the DC Universe APP, I bought the big iPad Pro over the weekend and I'm now making the switch to digital. I thought I wouldn't like it, but with the size of the screen, it's perfect. Whether this is what DC wanted or not, my next move was to take Bronze Age Doom Patrol out of April DCBS order along with a couple other collected editions. I will still buy Absolute Swamp Thing if it ever gets printed, but I think that's it for collected editions. Now I'm eyeballing my shelves to see what I should sell. What a paradigm shift for me in only a few days, but I think I'm more at peace with the switch. If you’re anything like me, you’ll have no trouble. I was very much anti-digital, had a MASSIVE collection. But once I decided to move overseas, I knew taking my collection would be impossible. But, worried I’d hate digital, I didn’t sell anything until I tried it out on a big ol’ iPad Pro. Once I started, I took to it pretty quickly and have not looked back. I made back the cost of the iPad and then some, which also helped with any lingering doubts about my decision. Being able to take a big run of comics (or multiple runs!) anywhere so easily, and the display size being so large is a dream. And it’s way lighter and easier to read than a big ol’ omnibus (and I say this as a staunch omni guy and huge proponent of custom binding.) I kept some of my books for sentimental reasons and a few of my favorite customs, but still prefer the digital ones, especially new comics that are in such hi-res that you can zoom in with little to no quality loss. That said, I still regularly check out what’s coming out, even if I can’t buy it cheaply. The Absolute Swamp Thing, as well as the recent Morrison omnis have tempted me though, admittedly.